The company’s new Apple Watch can perform ECGs, detect atrial fibrillation and contact emergency services in the case of a fall. Apple has taken a major step into the world of regulated health technology with the announcement of its new Apple Watch, an over-the-counter FDA-cleared device with the ability to perform electrocardiograms and detect atrial fibrillation. The regulatory approval comes in the form of a De Novo clearance from the Center for Devices and Radiological Health meant as a regulatory nod for a low-risk, first-of-its-kind device with no known predicate. At the company’s worldwide product launch event, the company unveiled the new features of its device which includes better heart and health monitoring sensors and the capability to take an ECG at any time. According to the FDA’s De Novo clearance letter for the ECG technology, the device is intended for over-the-counter use and not intended for use by people under 22 years of age. The company said that the ECG readings take about 30 seconds and are stored in the Apple’s Health app, where it can be sent to doctors using Apple Health Records or via a PDF. “In my experience, people often report symptoms that are absent during their visits. That is why this information is vital,” said American Heart Association President Ivor Benjamin at the event. The watch is also able to detect irregular heart rhythms that could mean atrial fibrillation, an irregular heart rate that can increase the prospect of stroke, heart failure or blood clots. Between 2.7 and 6.1 million people in the US have atrial fibrillation, according to the CDC. “This update really establishes the company’s increasing efforts to push the watch as a serious medical device. Apple seems to be diving into heart disease first, the most common cause of death around the world, making serious moves as a health company,” wrote Ross Muken, an analyst with investment advisory firm Evercore in an investor note. According to the company, both the irregular heart rhythm alert and the ECG have received FDA clearance and will be available to US customers later this year. The new device has sensors built into the watch’s back and crown and will retail at $399 for the basic model. “The FDA worked closely with the company as they developed and tested these software products, which may help millions of users identify health concerns more quickly. Health care products on ubiquitous devices, like smart watches, may help users seek treatment earlier and will truly empower them with more information about their health,” FDA Commissioner Scott Gottlieb and FDA Center for Devices and Radiological Health Director Jeffrey Shuren said in a joint statement. The new watch is also able to call for emergency services when it detects a fall using its accelerometer and gyroscope. That means a huge new market for Baby Boomers and elderly users. According to the National Council on Aging, falls are the leading cause of fatal injury and the most common cause of nonfatal trauma-related hospital admissions among older adults. “Fall detection is a feature that we hope you never need but it’s really nice to know it’s there,” Williams said. 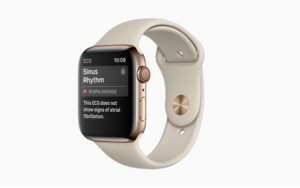 Previously ECG capabilities were only available through third-party companies like AliveCor, which interfaced with the Apple Watch though its KardiaBand application. While Apple’s announcement could squeeze these competitors, AliveCor has responded by pushing its medical-grade technology forward, recently gaining FDA “breakthrough device” designation for its bloodless potassium sensing technology. CEO Tim Cook had previously indicated that the FDA testing process would slow down innovation for the Apple Watch. However, soon after he made those comments, news broke that Apple was in conversation with the FDA about two cardiac monitoring products. With the company’s most recent announcement, we now know that those plans have come into fruition.